One of the greatest rivalry take place between the two LA Liga teams Real Madrid and Barcelona. Real Madrid made number of changes to the squad and bring some more new players to make a stronger side for the upcoming LA Liga season (2017-18). Barcelona who had a difficult season last year with just 3 points difference they lost league title to Madrid. No they have already suffered a big loss in the summer transfer window, as Neymar JR moved on transfer to PSG on record deal. Lionel Messi gets a good start of his new season and scored many goals in his last few matches for Barcelona. On the other-side Cristiano Ronaldo hopeful to get another Ballon D’Or award and looking to put more goals in the opponents net. He won champions league and la liga title with Real Madrid twice. The first El Clasico match will be played on (23 December 2017) at Santiago Bernabéu Stadium. Here you will see the details of the channels where you will watch the EL Clasico match coverage. The second el-clasico match fixture will be held in 2018 on Sunday 6th May. This time the team of Barcelona will host Real Madrid at (Camp Nou). 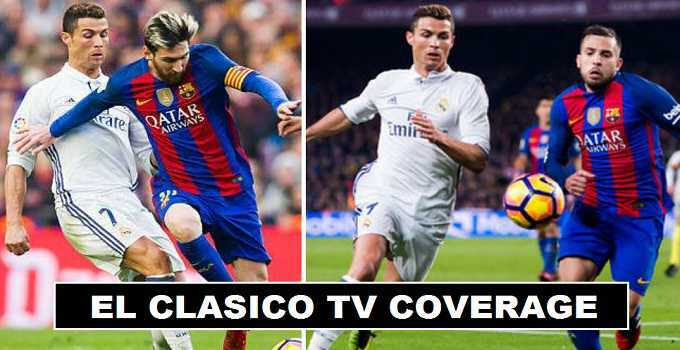 What channels will be provide the coverage in your countries will be discussed in the above given table and the channels names mention on which you can see the match between two LA Liga giants. In United Kingdom El-Clasico can be watched on Sky Sports and Fox Sports and beIN Sports have rights to show the match telecast in United States. In India the match will be broadcast on Sony SIX or more probably (Sony Ten).